Cristiano Ronaldo scored twice at Celta Vigo to ensure Real Madrid need just a point from their weekend game at Malaga to win the LaLiga title for the first time in five years. 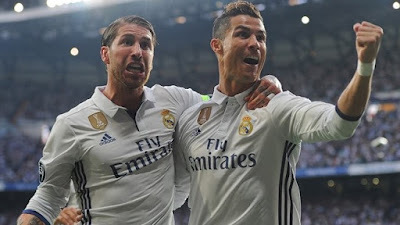 Ronaldo, who in reaching 368 league goals for a top European club overtook Jimmy Greaves in the all-time scorers list, struck early in each half as Real held Celta at arm's length to claim a 4-1 victory. Even though Celta's star man Iago Aspas was sent off, John Guidetti managed to make some amends for his late miss at Old Trafford last week with a response after the hour mark, but Karim Benzema and Toni Kroos made sure to protect Real's three-point haul. The capital club head to Malaga on Sunday three points clear of Barcelona, who will retain their crown if they beat Eibar and Real lose on the south coast, due to their superior goal difference. This game was originally scheduled for February but had to be postponed due to storm damage at Balaidos, with its rearrangement for the final week of the season creating some extra drama. For Celta there was another opportunity to move on from the missed opportunity of last week's Europa League semi-final loss to Manchester United, which took them so close to a date with Ajax. However, Portuguese striker Ronaldo, who had matched former Tottenham forward Greaves' achievement with his goal in the 4-1 thrashing of Sevilla, did not care and 10 minutes into Wednesday night's match he nudged the 77-year-old Englishman into second place. Picking up the ball in what seemed like a safe area Ronaldo looked up and fired an unstoppable left-footed drive into the back of Sergio Alvarez's net. Real did not dominate the first half with an iron grip, however, and Celta enjoyed good chances to level, with Keylor Navas doing well to deny Daniel Wass when his free-kick was hit with venom. Aspas, formerly of Liverpool, curled wide with his left boot and Celta thought they had a penalty when Raphael Varane appeared to handle the ball when Jonny tried to go around him. Three minutes into the second period Ronaldo propelled Real into a commanding lead after receiving a clever pass from Isco, and Celta were further wounded when Aspas saw red for a second booking. Guidetti, who came within inches of sending Celta to Stockholm for the Europa League final, cut through the disappointment with a deft finish from a Pione Sisto assist. Any joy was short-lived, however, as Benzema re-established Real's two-goal lead with a final touch on Marcelo's ball into the Celta box on 70 minutes. Tempers flared as time ticked away and Pablo Hernandez and Sergio Ramos earned yellow cards for clashing on the Balaidos pitch. That was a sideshow and did not distract Real sufficiently to prevent a fourth goal, which Germany international Kroos claimed when Benzema exploited a mistake by Facundo Roncaglia.